There’s been a lot of great music in recent years which could be described as psych-rock, yet there are few that have captured the freewheeling, sun-soaked branch of psychedelia which runs through the heart of the debut album by Wildest Dreams. 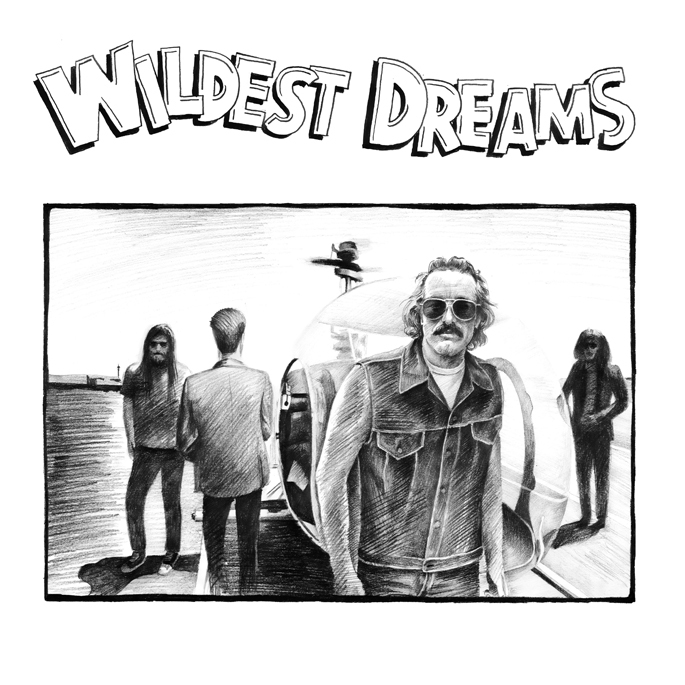 Formed by DJ Harvey and apparently recorded a few years ago, Wildest Dreams is a 50 minute escape into the greatest summer road-trip you never had. While sounding too alive to be merely described as retro, it’s still fair to say that the album finds its inspiration in 60s psych and 70s rock. The album opens with the blissful ‘Rollerskates’. A sun-stroked, meditative tune which finds Harvey cryptically singing about, “unshakable mirror-like wisdom” and roller skates. It sounds like the lyrics could have been scrawled at 3am with a mouthful of magic mushrooms, but they work perfectly with the album's themes and generally Zen-like disposition. ‘Boosh’ rolls us into a swirling, psychedelic pool; a tight hypnotic rhythm and drops of acid-flecked guitars that just seep from the speakers. Things really get going with the eight-minutes of sleazy funk ‘n’ roll which make up ‘Last Ride’. Certainly an album highlight, ‘Last Ride’ perfectly encapsulates the spirit of the LP. The track is propelled by a sped-up Doors groove, stabs of organ and some of the finest drumming I’ve heard in a while. The dirty funk continues into the road anthem ‘405’ with Harvey singing, “Budge over, baby, it’s my turn to drive”. Harvey’s voice is laid-back, our reliably friendly (yet heavily inebriated) guide through Wildest Dreams’ trip. The instrumental ‘Pleasure Swell’ drops us back into Doors territory; with an introduction that mirrors the famous opening notes to ‘Riders of the Storm’. It’s so close, in fact, that it kind of feels like an instrumental cover-version. It works well enough but certainly loses them some originality points. The catchy ‘Gypsy Eyes’ picks up the pace and sounds like a lost 70 psych-pop classic. At times, the album feels like you’re sat up front in an open-top car, flicking through the radio stations and constantly coming up with the good stuff. The playfully spontaneous ‘Yes We Can Can’ veers more into experimental territory, squelching electronics all backed by a presumably deliberate Can-indebted beat. It’s a great piece of music. ‘She Loves Me Not’ delivers another 70s rock-FM track full of sharp riffs and tales of troubled love before the brilliant ‘Off the Lip’ locks into an irresistibly cool, Wooden Shjips style groove. ‘Scorpion Bay’ wraps things up with another ridiculously brilliant strut. I just hope no beer company representatives hear this and it ends up on an advert for the rest of eternity. Lesser musicians would have perhaps made a fairly clichéd album with Wildest Dreams’ raw ingredients, yet the band do something genuine, heartfelt and exciting with their influences. The album works as pure, unbridled psych-rock escapism. It’s all moustaches, open roads and Kerouac novels here. And when the weathers this good, it’s a perfect mix. Are you having a bit of an Indian summer there, Andy ? Sounds good. I'm lovin' all these psych releases. I've been enjoying this album. And yes, it's bloody boiling here! I've been trying to buy a fan but everywhere's sold out. I've had to order one.